Editor's insight: Kevin Doughten shares his favorite stories from the Band guitarist's riveting memoir. 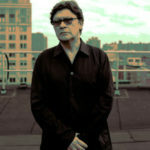 Robbie Robertson is one of the most beloved songwriters and guitarists of the last half-century and is responsible for penning songs like “The Weight,” “The Night They Drove Old Dixie Down,” and “Up on Cripple Creek,” which he and his partners in The Band made popular. Testimony is Robbie Robertson’s captivating memoir, which employs his storyteller’s voice to reflect on his journey to musical stardom, from his boyhood on the Six Nations Indian Reserve to early days on the road with rockabilly legend Ronnie Hawkins and The Hawks, to “going electric” with Bob Dylan on his 1966 world tour, to the formation of the Band, who ended their musical legacy with a final concert, one that was brought to life for all time in Martin Scorsese’s great movie The Last Waltz, celebrating its 40th anniversary this year. Crown Archetype Editor Kevin Doughten had the good fortune of working with Robbie on Testimony and got to know him through his writing. The memoir tells more than just the story of the Band; it’s the story of a time and place–the moment when rock ‘n’ roll became life, when legends like Buddy Holly and Bo Diddley crisscrossed the circuit of clubs and roadhouses from Texas to Toronto, when The Beatles, Hendrix, The Stones, and Warhol moved through the same streets and hotel rooms. It’s the story of exciting change as the world tumbled through the ’60s and early 70’s, and a generation came of age, built on music, love, and freedom. Above all, it’s the moving story of the profound friendship between five young men who together created a new kind of popular music. 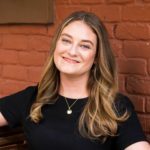 Here, Read it Forward’s editor Abbe Wright asks Kevin about the moments in Testimony that surprised and delighted him. Read it Forward: What was the factoid or anecdote in Testimony that surprised you the most? Kevin Doughten: There’s a beautiful story Robbie tells about when Levon and the Hawks were struggling to make ends meet in the mid-1960s and someone suggests that he and Levon wear masks and rob a high-stakes poker game in Arkansas. It has a fascinating ending, which I won’t give away, but the story is deeply revealing, not just of the circumstances in which Robbie and his bandmates found themselves in those early days—running with criminals and con-men—but of the friendship between Robbie and Levon, which was tested. I’d never heard this story before and it gave me so much insight into a time and place and a very deeply felt bond. RIF: Are there any photographs in the book that are being published for the first time? KD: We are fortunate to have a number of photos from Robbie’s childhood that have never been seen before. 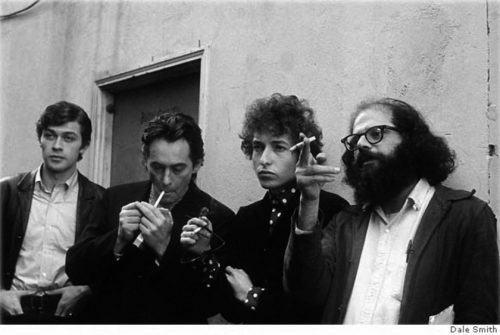 Of the ones from his best-known years, there’s a fabulous photo taken in San Francisco by Dale Smith that shows Robbie, Bob Dylan, Allen Ginsburg, and Michael McClure standing outside of City Lights. In the book, Robbie talks about how he moved to get out the frame, but the photographer told him to get in the shot. It’s a perfect moment and a kind of statement about the worlds that rubbed up against each other during a very fertile creative time. 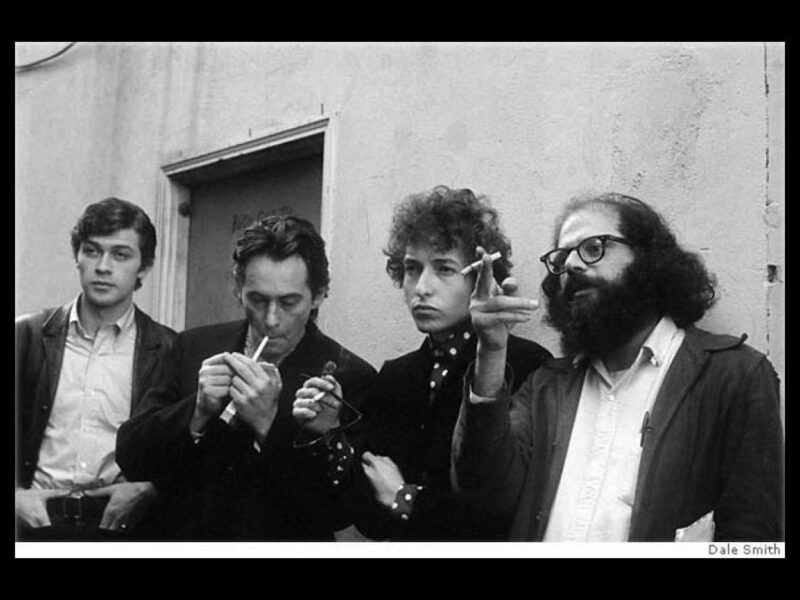 Robbie Robertson with Michael McClure, Bob, and Allen Ginsberg at City Lights Bookstore, San Francisco. Photo by Dale Smith, dale-smith.com. RIF: What are some myths about The Band that are dispelled in this book? KD: I think the key thing is having Robbie’s deep perspective on the Band’s journey, something that has never been out there like this before. Reading this book clicks a lot of things into place and gives the story a sense of balance. I don’t know that I’d say the book dispels myths but rather gives people a new way of looking at definitive moments, like the Band’s world tour with Dylan or the making The Last Waltz. RIF: Is there something you think die-hard fans of The Band will be surprised to learn about the making of The Last Waltz? KD: To me, watching The Last Waltz is a perfect experience. It works so powerfully onscreen. It’s transporting. You would never know from the movie how incredibly difficult it was to pull off. Robbie’s unfolding of the conception and execution of the show is one of the book’s great set pieces. You feel like you’re right there when they’re tearing up the floor of the Winterland Ballroom to put in the camera stabilizers, or rehearsing with the Band and Muddy Waters. It’s like a great magician’s trick. In the movie, you see what Martin Scorsese wanted you to see. Robbie pulls back the curtain here, and it’s glorious. RIF: Do you think Nobel Prize winner Bob Dylan had an influence over Robertson’s own songwriting? KD: Well, it’s hard to think that all the time they spent playing together didn’t rub off at all, but Robbie is great at talking about where the ideas for his songs came from and how he reached a place where he was able to write them. There’s a merging of two strands of his life–the many stories and characters he was woodshedding from all of his years on the road with Ronnie Hawkins and then with the Hawks, and his deep interest in screenplays that developed once he discovered the Gotham Book Mart in New York City. I do think he and Bob Dylan were both mining the deep history of American lives, and you can see from the book, I think, the big effect that having the clubhouse at Big Pink—and being in that unparalleled creative atmosphere with someone like Dylan—had on Robbie’s growth as a songwriter.